distribution. However, the misalignments of electron beam and apertures, and astigmatism in the condenser lenses prevent formation of real Gaussian intensity distribution. Especially, there may be six different C1 lens excitations, each of which gives a different calculated beam size, giving more complexity. Furthermore, if a too small aperture is selected the intensity distribution will be truncated at a fraction of the full Gaussian curve. If a too large aperture is selected the actual beam will extend out well beyond the calculated size. 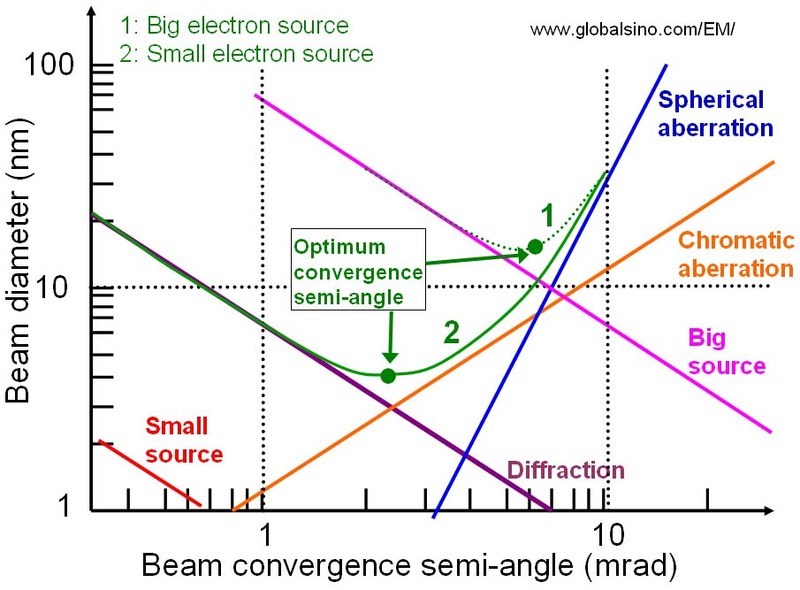 where i is the beam current, β is the brightness of the electron source, α is the convergence semi-angle of the electron beam, Cc and Cs are the chromatic and spherical aberration coefficients of the system, and E0 and ΔE are the average energy and the energy spread of the electrons in the beam. where dg is the initial Gaussian diameter at the gun. ds beam broadening effect of spherical aberration in the beam-forming lens, and dd diffraction effect at the final aperture. i is the current in the electron probe and α is the aperture angle. Equation [4954c] suggests beam diameter (d) increases with beam intensity (i). Equation [4954d] indicates the diameter of the disc with minimum confusion caused by spherical aberration. Clearly, this term is not Gaussian unless the beam is correctly apertured, which, as we mentioned above, is not always possible. However, Cs correction can reduce this contribution to the beam broadening. The diameter due to diffraction (dd) is the Rayleigh criterion and refers to a spacing between two overlapping images of the beam. The diagram in Fig. 4954 shows how these sources contribute in a typical column according to Equation [4954b]. In systems with thermionic sources (big source), spherical aberrations tend to be the limiting factor for beam diameter, while chromatic aberrations dominate in field emission systems (small source). Figure 4954. Diameter of the electron-beam as a function of beam-convergence semi-angle. 1: big electron source. 2: small electron source. In scanning electron microscope (SEM), spherical aberration of the probe-forming lens is increased with the increase of working distance, resulting in a larger electron-probe size. Therefore, the need to have better spatial resolution of SEM leads to shorten the working distance and consequently to change the SEM detector position. Many modern aberration-corrected STEMs have electron probes less than one atom dimension in diameter so that atom column resolution for composition analysis can be obtained. In order to improve the energy spread of the electron sources in EMs, monochromators have recently been introduced. In the best cases, the energy spread with a monochromator for any source can be reduced to < ~100 meV. There are two basic setups: the Wien filter with crossed electric and magnetic fields and the electrostatic Omega filter. It is very common that both types improve the energy width to about 0.2 eV at an acceptable beam current of several 100 pA. The single Wien filter limits the probe size to about 2 nm, whereas there is no such limitation in the case of the Omega filter. J. I. Goldstein, Practical scanning electron microscopy. Electron and ion microprobe analysis, 1975.